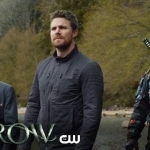 Arrow 5.23 “Lian Yu” (Season Finale) review: Oliver knows where the final battle will happen – Lian Yu (Purgatory). Oliver explains the deal to Slade. He’s taking Digger Harkness (Jai Courtney) too. Slade is sane and Oliver gives him the means to find his own son. Slade remembers everything he did on the Mirakuru. He’s sane now, and Oliver gives Wilson the Deathstroke mask. Nyssa and Merlyn banter. Such fun! Oliver walks up with Harkness and Wilson. A bomb destroys their weapons and way off the island. In the past, Drago, I mean Kovar (Dolph Lundgren) orders his men to find the escaped Oliver. Oliver takes out 6 guys. Splitting up, Digger, Slade, and Oliver find the prisoners, but no William. It’s a trap! Digger immediately betrays him (actually before he got there). Did he get to Slade too? It looks like yes for a second, but Slade outmaneuvers them and they lock Talia and Evelyn (Madison McLaughlin) up. 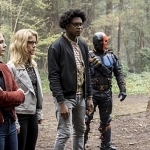 Merlyn leads Felicity, Curtis Echo Kellum), and Thea to safety, and Felicity gives Oliver a nice smooch. “You can’t get over the death of your father.” Slade gives Oliver the Rocky speech. Felcity and William’s mom have awkward conversation. Thea is in the middle of rejecting her father when she steps on a land mine. Merlyn tricks her and shoves her off the mine, taking her place. A few minutes later, there is an explosion. Thea is messed up. They find the hideout. 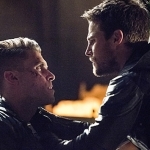 Slade punches Oliver. Looks like betrayal to me. Oliver is brought to the others, giving Dinah an anti-dampener. Nyssa and Talia battle, and Slade takes out her crew. Oliver against Chase, Slade against 5 ninjas, Canary and Siren – it’s just one of those bananas finale fights. It goes back and forth between the present day fight and the flashback one, the past mirroring the future, with one exception. He doesn’t kill Chase, even when the murderous maniac says he killed his son. The island is rigged with explosives. Chase disappears in a flash. Come on! Oliver catches him on a boat. 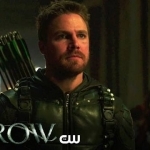 He makes Oliver make a choice – everyone he cares about or William. Oliver still chooses not to kill Adrian. He manages to get the kid away from crazypants, but Adrian puts a gun to his own head and pulls the trigger. The whole island explodes. There’s no way everyone got off that island. Man… the team had to get off the island, right? That’s a gigantic cliffhanger. Can they just demolish the entire cast and start over? I cannot believe they would do that. The finale was very good. The Arrow finales usually are. I was hoping for some resolution and happiness, and now have to wait months for them. They went big – “Kill everyone” must have been the directive on the script. – Nice juxtaposition between the past and the present. – Even though everyone may be dead because of it, I am glad that Oliver did not succumb. – Olicity! Or not since she may be dead. – Chase also killed his crew. I bet they are upset they backed the wrong horse. – Just a beautiful, beautiful moment when we get to see Oliver call his mother, Moira (Susanna Thompson), to tell her he is alive. See you in season 6! 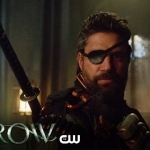 DEATHSTROKE, NYSSA AL GHUL, MERLYN AND DIGGER HARKNESS JOIN OLIVER’S BATTLE AGAINST PROMETHEUS — The battle between Oliver (Stephen Amell) and Adrian Chase (Josh Segarra) culminates in a final epic battle on Lian Yu. 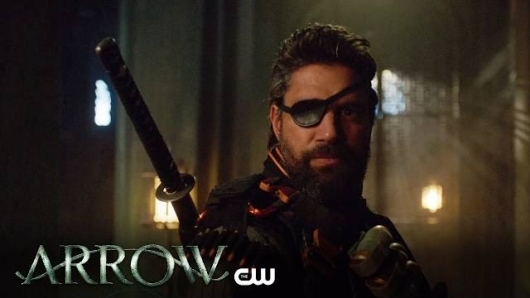 After recent events, Oliver decides to recruit a group of unlikely allies — Slade (guest star Manu Bennett), Nyssa (guest star Katrina Law), Merlyn (John Barrowman) and Digger Harkness (guest star Nick. E. Tarabay) — to defeat Chase. However, Chase has his own army — Black Siren (guest star Katie Cassidy), Evelyn Sharp (guest star Madison McLaughlin) and Talia al Ghul (guest star Lexa Doig) — and the forces collide in an explosive season finale. Jesse Warn directed the episode written by Wendy Mericle & Marc Guggenheim (#523). Original airdate 5/24/2017.